Using a credit card to pay your taxes might seem like a bad idea, but it is possible to earn cash back or rewards points and still come out ahead even after the convenience fees. Is It A Good Idea To Pay Your Taxes With A Credit Card? First off, you should only consider paying your taxes with a credit card if you are a Financial Jedi. This means you pay off your credit card balances in full every month to avoid the interest charges. If you are only a Financial Padawan and aren’t out of credit card debt yet, you should stick with the other ways to pay your tax bill. Making only the minimum payments on your credit card can more than double the amount you’ve paid on your taxes. If you can’t pay your taxes right now, you will pay less in interest and penalties by entering into a payment agreement with the IRS. The IRS offers several methods to pay your taxes. Paying your taxes by paper check or electronic funds transfer through Direct Pay is free. To pay taxes by credit card, the IRS has partnered with three payment processors where the convenience fee currently ranges from 1.87% to 1.99% of the payment amount. 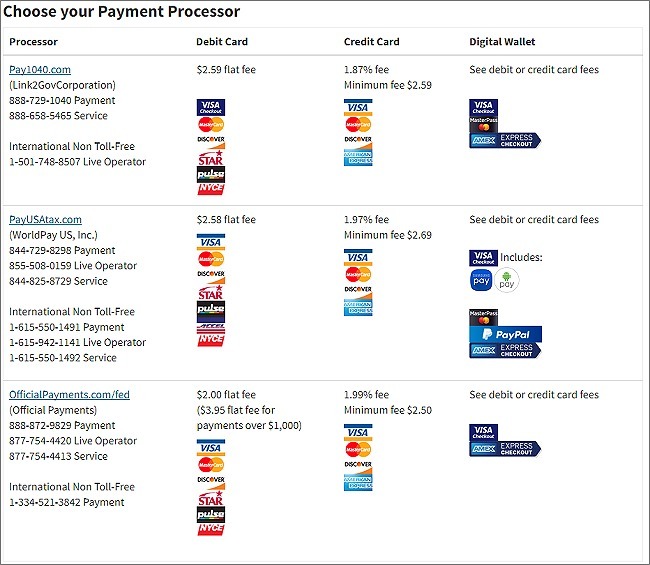 Looking at the above table, Pay1040.com charges the lowest convenience fee. To profit by paying your taxes with your credit card, you will have to find a way to earn more rewards than 1.87%. In theory, any cash back rewards card that offers more than 1.87% will earn you money when paying your taxes with a credit card. Looking at some of the cash back cards available, you will find a few rewards cards that offer 2% cash back in the “other purchases” category. For example, there is the Fidelity Rewards Visa Signature card that gives unlimited 2% cash back on all purchases when you deposit the cash back into an eligible Fidelity account. There is also the Citi Double Cash card, which gives unlimited 1% cash back on purchases and another 1% when you pay it off. Subtracting 2% from 1.87% nets .13%, so if you were to pay a $10,000 tax bill you will only get $13 back. That’s about enough to pay for lunch and barely worth getting excited about. The card with the best cash back rewards right now is instead the Discover It Miles card. This card has no annual fee and offers 1.5 miles for every dollar spent on all purchases. Even though this is a travel rewards card, the miles can be exchanged for cash. What makes this card better than the others is that Discover will double the total rewards earned in your first year, effectively making this a 3% rewards card. The Discover It Miles card will net you 1.13% after processing fees so every $10,000 in taxes paid will earn you $113 your first year as a cardholder. Much better. Because of high competition in the credit card industry right now for new customers, credit card companies are offering generous signup bonuses to apply for and use their cards. Rewards can be had for everything from credit towards travel, air miles, hotel stays, and even cash back. Signup bonuses have ranged from $150 to $750 and up to $1,900 worth of rewards points in the past in the case of the American Express Platinum Card. To get these bonuses, you will usually need to charge anywhere from $500 to $5,000 within 3 months of becoming a cardholder. Spending enough to hit these bonuses within the required timeframe can be difficult. Not everyone shops at Whole Foods. One example of a card with a lucrative signup bonus promotion is the Chase Sapphire Preferred, which rewards a new card member with $625 towards travel for spending $4,000 within 3 months. The card’s $95 annual fee is also waived for the first year. A $10,000 tax payment will net you $438 after the convenience fee. You can even apply for another card from another company and split your tax payment between them to maximize your reward bonuses. For those who are self-employed or have income from other sources than normal employment, the IRS lets you pay your quarterly estimated taxes with your credit card too. To avoid the underpayment penalty, the IRS allows you to pay 90% of the current year’s income tax liability or 100% of the taxes from the prior year, whichever one is less. If you are paying 100% of the prior year’s taxes, most people divide the amount by four and make equal payments quarterly. But if you are trying to hit the spending requirement for the new card member bonus, there is nothing stopping you from paying a larger amount up front. As mentioned previously, you can split your tax payment over two credit cards. According to the IRS website, there is a limit of two payments per year when paying your taxes for Form 1040. When paying your estimated taxes for Form 1040-ES, you are allowed two payments per quarter. This allows you to pay your taxes with different credit cards and earn the most rewards benefits. No one looks forward to owing the IRS money come April 15. For those who tend to spend most of their paychecks, a tax refund can be seen as the IRS helping them “save” some extra money for a rainy day. If you will be getting a refund, here are some smart ways to get the most out of your tax refund. For the ones who are financially savvy, we know that a refund is us getting our own money back after giving an interest-free loan to the government for the past year. If you are able to pay off your tax bill by the deadline, owing taxes is a better deal. By planning ahead, we can put our money to work to make more money in the meantime. 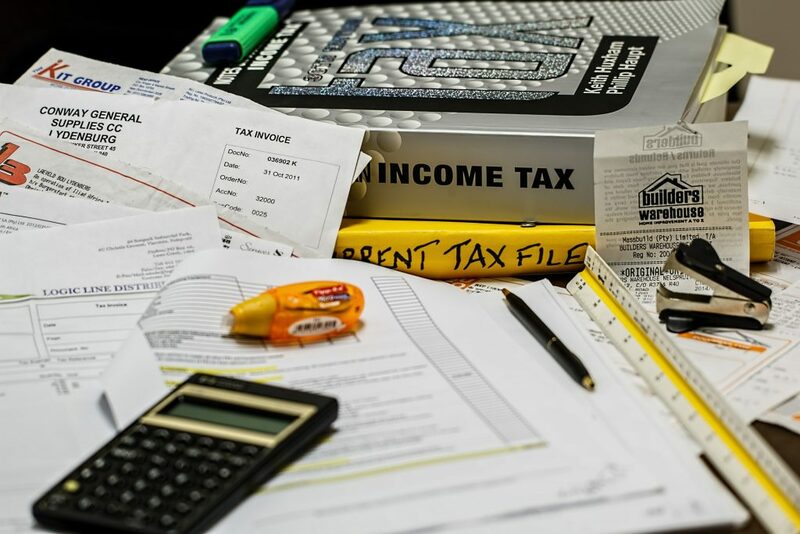 Paying your tax obligations with a credit card for the rewards and then paying off the balance to avoid interest can be an easy and profitable way to take some of the sting out of owing a bunch of money to the government at tax time. What do you think about using a credit card to pay your taxes? Have you paid your taxes with a credit card before? Are there any credit cards that you would recommend using to get the most rewards?